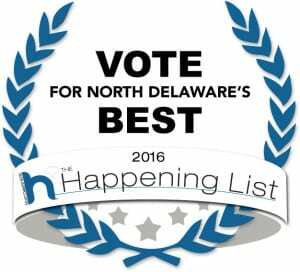 Frightland has been nominated for Best Delaware Amusement 2016 by North Delawhere Happening List 2016. The magazine has an annual Happening List Awards and award ceremony where Delaware businesses, people and events are nominated in 13 different categories across multiple awards. The Delaware public votes on the winner and it all comes together in a wonderfully fun 2016 Delaware Happening List event this Spring! Frightland is nominated for the 2016 Happening List in the Best Delaware Amusement category along side some very worthy contenders. We would love your support in voting for us as the best Delaware Amusement 2016 from the Delaware Happening List! While you’re there, vote for the Delaware Mud Run as the Best Delaware Fundraiser, Leukemia Research Foundation of Delaware as the Best Delaware Charity and our very own Kyle McMahon as Famous Delawarean.